Barbara A. Ley has practiced public accounting for 35 years and for the last 25 years has headed her own firm. For two decades, she has brought her charitable-minded clients to the Oklahoma City Community Foundation to benefit from the many services that are offered. The longtime CPA credits the late Marilyn Myers, community advocate and former director of the Kirkpatrick Family Fund, for educating her on the many aspects of the Oklahoma City Community Foundation. 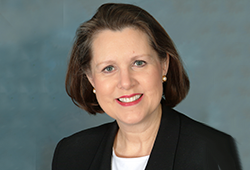 "As an advisor, we endeavor to see that our clients' wishes and needs are addressed appropriately," Barbara says. "One of the most important things I can do for a client is to connect or direct them to a person or entity that can best take care of their needs. The Oklahoma City Community Foundation is a useful and effective tool in allowing me to assist a client in fulfilling their charitable intentions." A few years ago, one of Barbara's clients made a gift to the Oklahoma City Community Foundation to establish two scholarship endowments to honor family members. One endowment funds a scholarship for a graduating high school senior from the client's hometown ofPerry and a second endowment funds a scholarship for a graduating high school senior from Prague where the client's brother was an educator. "Thank goodness we have the Oklahoma City Community Foundation," Barbara says. "As an advisor, it is so important to know that a client referral will be met with excellent service and professional care. I can count on the Oklahoma City Community Foundation to perform at the highest level. I hope to give my clients peace of mind in the handling of their financial affairs and the staff helps to do just that." If you have clients with a desire to provide scholarships to Oklahoma students, then establishing a scholarship endowment fund at the Oklahoma City Community Foundation is an ideal option. Scholarship funds provide a unique way to honor or memorialize individuals as well as support the educational aspirations of others. We administer the state's largest independent scholarship program that generates more than 700 awards a year. The scholarship funds are as varied as they are generous. You can review a directory of the scholarships here. For more information on how we can help you help your clients accomplish their charitable giving goals, contact Joe Carter at j.carter@occf.org or 405/606-2914.